Monday, December 27, 2010 was a chilly 46 degrees as Good Morning America ended its first segment. Our daily routine includes the news, coffee and bird watching from bed. Gray Head, the Hooded Oriole that refuses to migrate, made his predictable morning stop at his favorite hummingbird feeder, and the usual number of Costa’s and Anna’s Hummingbirds were battling over the other eight feeders. As we left the bedroom, though, a glance through the sliding glass door revealed a sad sight: an adult male Costa’s, obviously dead on the slate beneath a patio feeder. Bummed out, I went outside, picked up the body and looked for a trash barrel. The bird was lying on his back in my palm, when I noticed a slight, slow movement in one leg. There was no apparent heartbeat or any other sign of life, but this one tiny movement gave me pause. I brought him into the house and Prudy and I held him snugly in the warmth of our hands for 30 minutes. At that point, miracles started happening. His heartbeat appeared, fluttering his feathers, and one eye opened half-way. We named him Lazarus. We lined a plastic box with a towel, placed it on an insulated heating pad and set him inside. He continued to show more signs of life, but also had difficulty staying upright, lolling to one side or the other. There were no overt signs of injury, but we worried that he had broken a leg or suffered internal injuries in a territorial-related collision. After a half hour, we filled a measuring cup with sugar water and held him next to the lip. 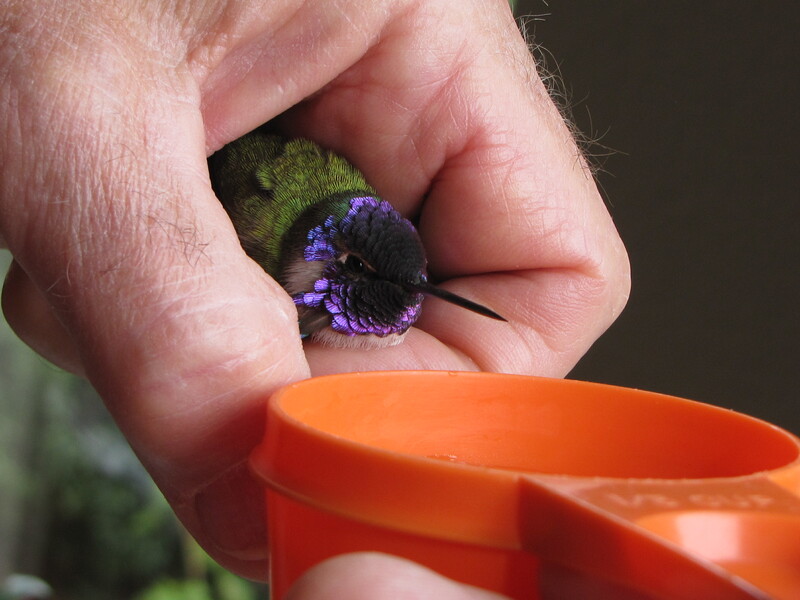 We dipped his bill into the liquid five or six times without reaction, when, suddenly, his tongue laced out of the tip of his bill into the nectar. During the rest of the day, we would hold him next to the cup every half hour, where he eventually began feeding with enthusiasm, and without prompting. By afternoon, when the day had warmed to 60 degrees, I took him outside and opened my palm, offering him a shot at freedom. He closed his eyes and hunkered down into my hand. Monday night we kept him in his warm box, but half expected to find a corpse in the morning. Tuesday, we found him as we had left him: still eager to feed, but otherwise listless. We set up a regular feeder reservoir in his box, placed him next to it, and went to a movie. When we returned mid-afternoon, he seemed a bit better, and must have fed while we were gone, since he wasn’t hungry. 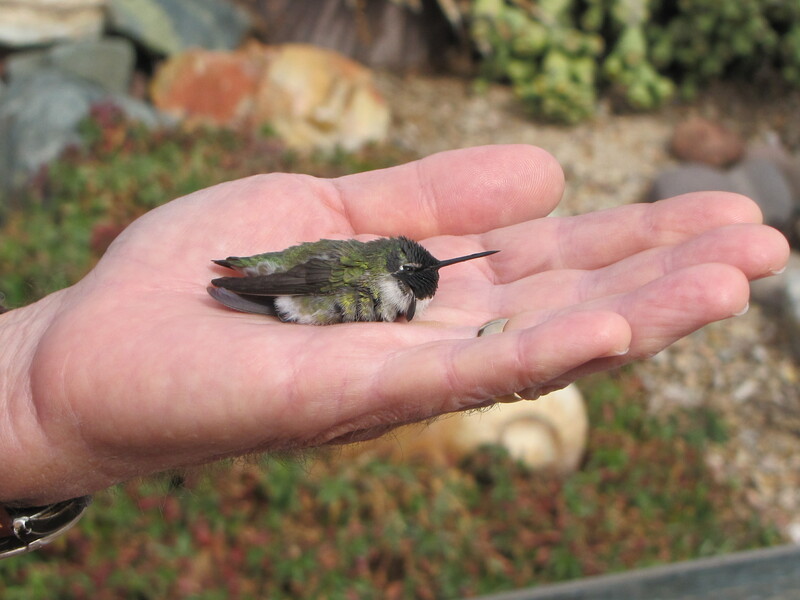 Since hummingbirds need insect protein to supplement the nectar, we decided to offer him freedom once again. He lay in my hand outdoors, unmoving except for turning his head each time another hummer streaked by. After fifteen minutes in the sun, he looked me in the eye, fired up his afterburners and buzzed to an Oleander 40 feet away. That evening, we sipped our wine from the upper deck and watched the setting sun turn the eastern mountains pink, as quotidian as the morning news and coffee. Quail chortled in the yard below, and hummingbirds took their evening tipple. One of them, a male Costa’s with an off-kilter purple gorget, stopped by and hung in the air not three feet from us. It was Lazarus. 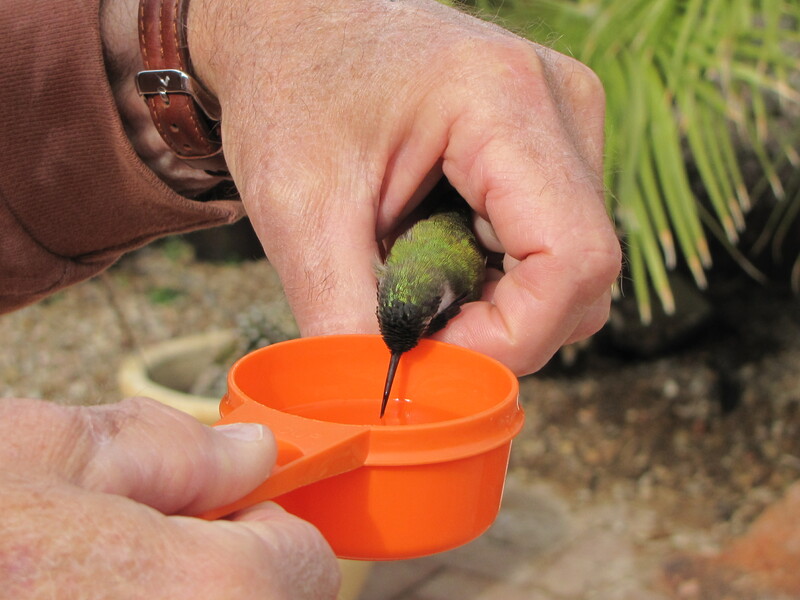 This entry was posted in Birding Arizona and tagged birds in winter, Costa's Hummingbird, reviving injured birds. Bookmark the permalink. Thanks for sharing, Bob. This brought tears to my eyes. Merry Christmas! Wow! Fantastic tale! 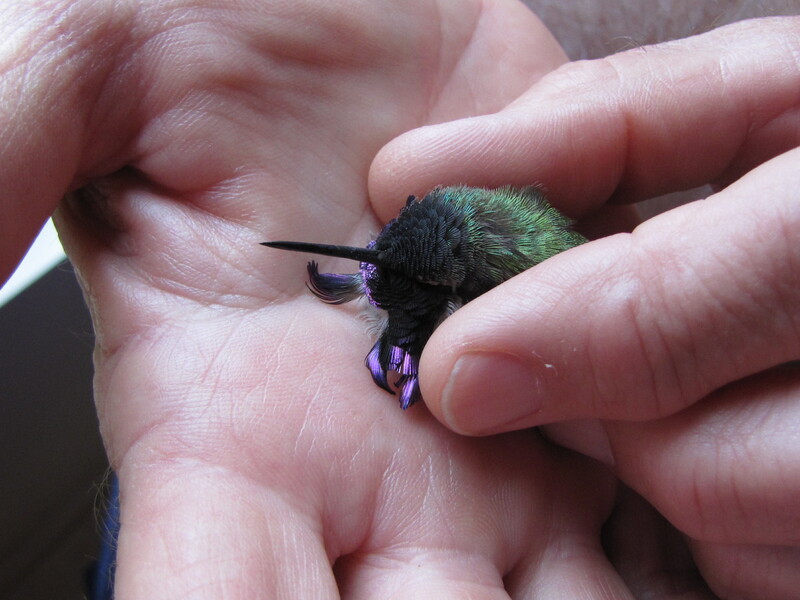 Hummers are so fragile. And yet, there’s a part of them that seems made of steel.